Frank Lloyd Wright (1867-1959) nakeuh sidroe arkitect asay Amirika Carikat. ^ "Wright on the Web: The Early Years". www.delmars.com. http://www.delmars.com/wright/flw1.htm. Geupeuhah bak May 18, 2008. ^ "Wright on the Web: The Fifties". www.delmars.com. http://www.delmars.com/wright/flw7.htm. Geupeuhah bak May 18, 2008. 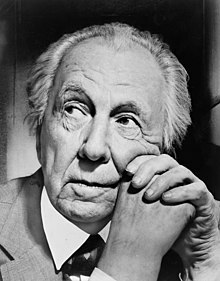 ^ "FRANK LLOYD WRIGHT: UNITARIAN ARCHITECT 1867- 1959". Harvard Square Library.com. http://www.harvardsquarelibrary.org/unitarians/wright.html. Geupeuhah bak July 21, 2013.